At the risk of wading into the lukewarm bathtub of hyperbole, service dogs are pretty much the greatest creatures in the entire world, perhaps even in the galaxy. There are probably some crazy awesome levitating jelly monsters that live by a code of pure altruism in some far corner of the universe, but that hardly seems relevant to our immediate circumstances here, on Earth, which are vastly improved by the existence of service dogs. Even if service dogs just sat around and played bridge only deigning to help us when they grew bored, they’d still be the best creatures around. Newly engaged couple Claire Johnson and Mark Gaffey said it was their guide dogs who fell in love first and are responsible for bringing them together. The pair live in Stoke-on-Trent in England. They met when they were attending guide dog training. 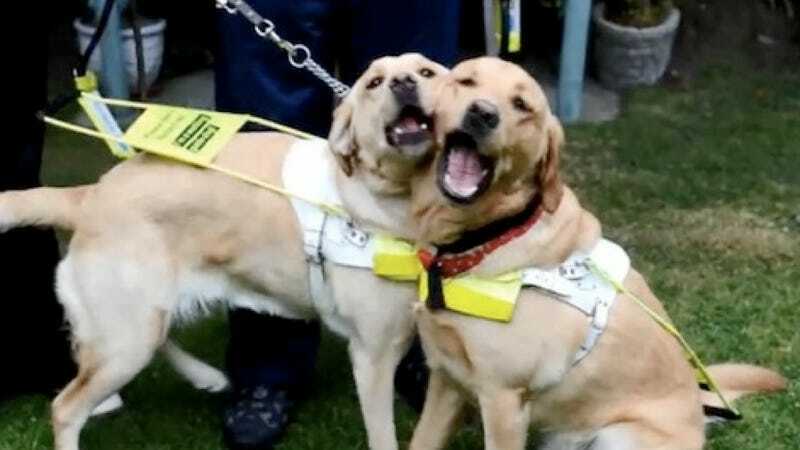 During the lessons their guide dogs, Venice and Rodd, were always playing together. Mark said, "The trainers said that they were the love and romance of the course, and they brought us together." In case you were wondering, the answer is yes — Venice and Rodd do share a bed where they cuddle the cuddles of blissful amorous golden retrievers.